President-elect Donald Trump has made it clear that he is not in favor of the Electoral College. 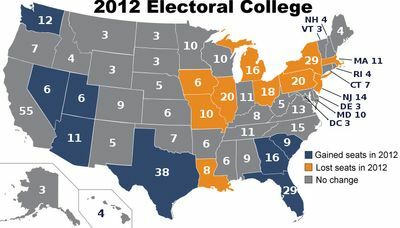 With that said, the abolition of Electoral College is gaining steam. There have been more than 700 bids to get rid of the voting system that is in place now. The most recent one was by then-Congressman Jesse Jackson Jr. in 2004. The National Popular Vote Compact has been gaining steam since 2007. It is popular because it would not require amending the Constitution. Under the plan, states would use their constitutional “plenary power” to award their electoral votes to the winner of the popular vote once there’s support among enough states to make it work. The proposal has been written into law in 10 states and the District of Columbia, which together control 165 of the 270 electoral votes needed to elect a president. In New York, Gov. Cuomo renewed the state’s commitment to the proposal indefinitely the day before Americans went to the polls last week. Legislation has also passed at least one legislative chamber in 12 other states with a total 96 electoral votes. Pat Rosentiel has predicted that this will be passed in time for the 2020 election. The states that have enacted the law up to this state all lean Democratic. The assumption is that Trump’s backing of the law will push the Republican side to get on board with it.